Which entry do you like best? Welcome to the GOTM Entry #1 Voting Thread! 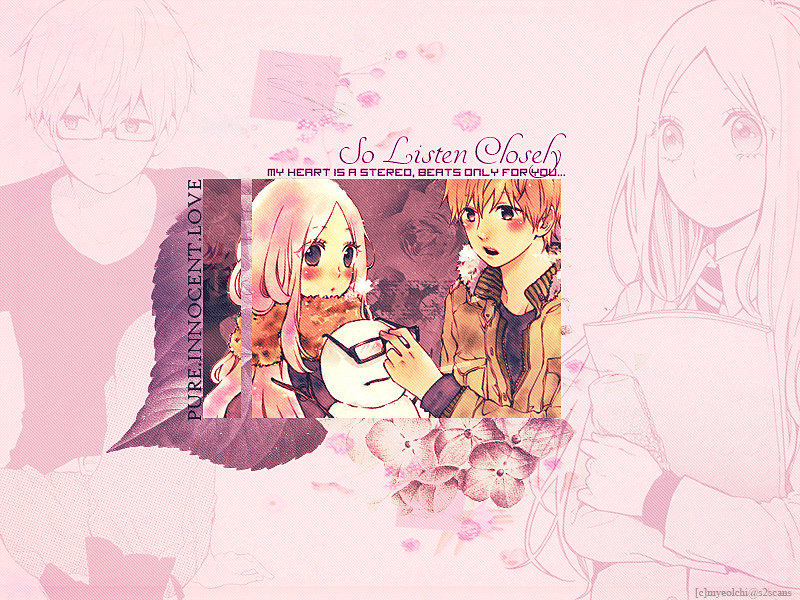 This month's theme was LOVE, chosen by our previous winner, Elinicia! You can vote for only one person. The person with the most number of votes wins. a. I voted for <A> because I like how the colors blend together. b. I voted for <B> because the background is pretty and fits the theme perfectly. This is not mandatory but it is appreciated! I voted for Myelochi's entry. I like the concept of having that small pic in the center of the larger background. I also like your overall use of the pink color scheme, as well as the way you positioned the flowers and leaves in the graphic. Lastly, great choice of cute characters there. They go well with the "pure, innocent love" thing you got going on. A minor nitpick on my part would be the use of Stereo Hearts lyrics - they kinda don't fit, but that's just me. Great choice of fonts, btw. Last edited by Daniela on Thu May 28, 2015 2:44 pm, edited 1 time in total. I'm sorry I haven't much to say, it's just, the King and I, you know. Hahaha. Epic love story and movie. I voted for Mia-sis. I like the concept and how you arranged your stocks. Those styles is for wallpaper and such which I am not familiar in making so its good to see new things in the GOTM. As for Dani-sis, I like King and I too (I was able to watch it when i was little). I love the blending and the GIF works perfectly with the background. As for my entry... it looks horrible and rushed compared to the other entries lol. 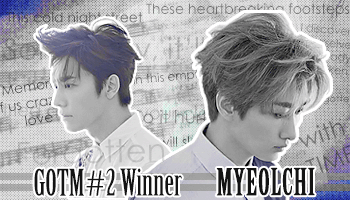 Great entries but my vote goes to Myeolchi/Mia this time. It just looks really pretty and shoujo-ish over-all. Language Arts skills, I summon thee! Mia-san: I felt that the background was too big. Since the colors were so light, the graphic felt somewhat empty. However, I really like this pairing! Even though I don't even know the name of the manga, they really do look like a pure and innocent couple! Actually, I liked the background too >.< It was creative, and it reinforced the feeling of a "pure innocent love". Nice color scheming! Daniela: I have never watched this movie before, but I thought the couple was interesting since it didn't exactly fit the mainstream idea of a couple. I want to go watch the movie now >.< I felt that having the couple split up on either side of the graphic might've detracted from the charm, but I think it brought the graphic together by framing it with their figures. Nice job with the dreamy gif! It highlighted the attraction of the couple! I liked the quotes. By splitting up the "scattered dream" and "far-off memory" line, it really did seem like puzzle "pieces," as the pink text suggests. The fragmented-looking background and splitting up the couple into opposite corners of the graphic further reinforced the idea of "pieces". Overall, although there were many different components of the graphic, somehow the atmosphere wasn't chaotic, crowded, or "too involved". Nice nice!